AVID brings research-based strategies and curriculum to educational institutions in elementary, secondary, and higher education to prepare students for success in high school, college, and a career, especially students traditionally underrepresented in higher education. 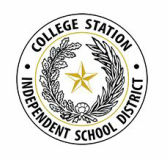 College Station ISD has AVID at one elementary campus, College Hills; all intermediate campuses, Cypress Grove Intermediate, Oakwood Intermediate, and Pecan Trail Intermediate; all middle schools, A&M Consolidated Middle School, College Station Middle School, and Wellborn Middle School; and two high schools, A&M Consolidated High School and College Station High School. For more information about AVID, click the following link: What is AVID?